Early Saturday morning I spoke with Dave as he and Heather were driving back from LaCrosse Wisconsin. Dave had worked out on a job site at 4am that day and was done by 10am. Since their garden was full of fresh peppers and tomatoes we decided to join them for a Fajita dinner. Saturday afternoon was pretty quiet for me as Chris was out to lunch with Laura. Laura was Chris’ new Innovativeduo.com blog partner. Since I had no “honey do” list I decided to read the paper and watch a little TV. I of course also took a nap! Chris got home around 4pm and started gathering things for dinner. As she was doing that I wandered down stairs to grab a couple bottles of wine to share at dinner. Since we were going to have Fajitas I wanted to have a Zinfandel. I had a few choices to choose from but decided on a Robert Biale 2009 Monte Rosso Zinfandel. Now that the Zinfandel was selected, I needed to decide on one more. I chose a 2004 Beringer Bancroft Ranch Merlot for the second bottle. We arrived at their home with Heather greeting us at the door. She asked Chris if she liked the text they had just sent, but we had missed it. The text was a picture of a glass of wine as Dave had started without us and it was his way of telling us to hurry! We do not have a lot of experience with Australian wines. However, the first Merlot Chris and I ever enjoyed and loved was one named “Hope” from an Estate in Australia. Since we have not had this wine I needed to take some notes. The Penfols Shiraz had a nice Garnet to Purple hue and was clear, but with visible sediment. As we smelled the Shiraz we noted bright fresh fruit and a hint of vanilla. Tasting the it, we noted that the tannins were soft and felt in my mid palette with a medium finish. It was medium bodied and we could taste Plum and red fruit. The acidity was nice and it made my mouth salivate. As the Shiraz warmed up it started opening up more. 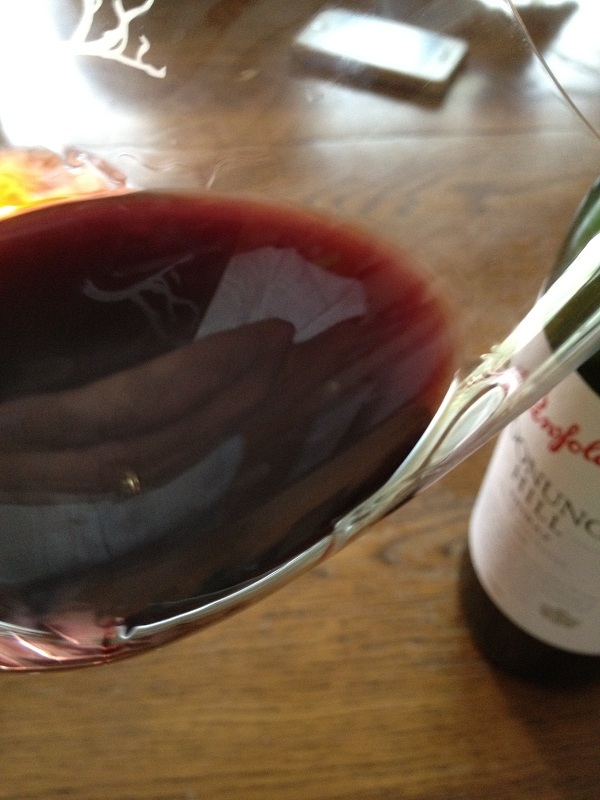 Initially I rated the 2008 Shiraz two glasses but by the end of the tasting, I gave it about a three. When we were finishing up the 2008 Shiraz it was time to eat. Heather and Chris were busy putting the food and plates on the table. 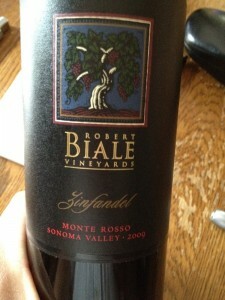 I grabbed the 2009 Robert biale Vinyards Monte Rosso Zinfandel and pulled the cork. I poured us each a glass (Heather too). Since we had a few additional minutes I grabbed the notepad and pen to take notes. I was working fast as to not interrupt dinner as you can see, because my glass still had bubbles from pouring it into my glass. The 2009 Monte Rosso was clear and no sediment. There was a nice Garnet to purple hue. There was a very noticeable spice to the nose. Excellent! 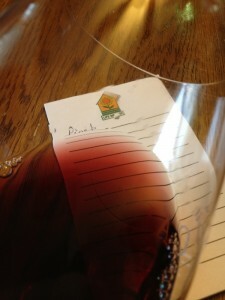 The tannins were nice and were felt in my mid palette and the finish was long. There were cherry hints along with spice. We also thought the Zinfandel was a little sweet which we all enjoyed. I have to say the spicy Fajita’s paired excellent with the 2009 Monte Rosso Zinfandel. I would rate this Zinfandel four glasses. We had wrapped up dinner and Dave decided to share another bottle. 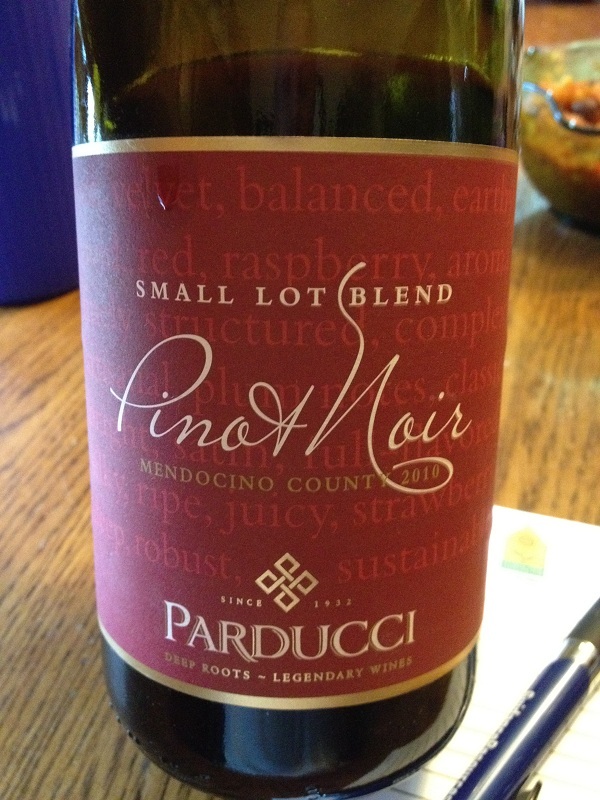 This time he had a Pinot from Parducci Wine Cellars. Usually I would start with a lighter bodied wine and move to the heavier one. But I figured why not since he was sharing? The color was Garnet with a Carmel hue. The meniscus was sharp and light and I could see the transition from the center of the glass to the edge. Light red fruit like cherry and raspberry. I also noticed light vanilla. Right away I could tell this was a Burgundian style Pinot Noir. Since this is not Chris’s favorite style of wine, she did not have much to say. I could feel the tannins in my palette with a short finish and could tasted cherry and caramel. Depending which one of us was drinking the wine, it was rated two and three glasses. For the price you can’t go wrong. 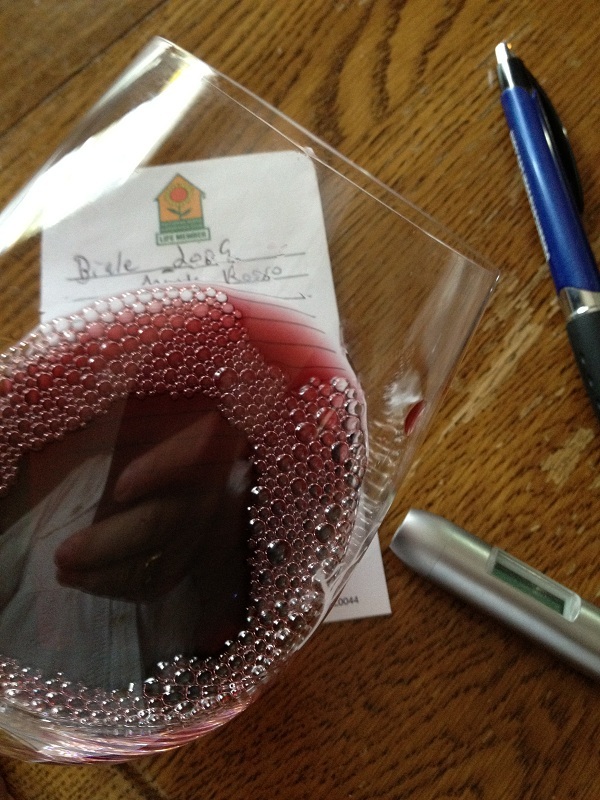 The Pinot held its own after drinking two heavier reds. We ended the evening with a glass of the 2004 Beringer Merlot and Dave pulled the cork on a St Barthelemy Cabernet Sauvignon Port that we all enjoyed. The port had a noticeable smell and taste of Brandy and was very nice. I asked Dave to order me a few bottles when he orders more of this Port in the fall. Dave and I would love to try to make our own Port. Standby….